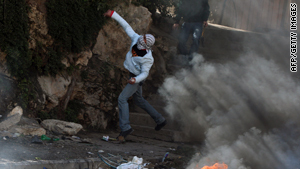 A Palestinian youth hurls stones at Israeli soldiers at the West Bank refugee camp of Qalandia on Thursday. Jerusalem (CNN) -- Israeli security forces said they will close the West Bank region from midnight Sunday to Tuesday, April 6. Only people who need medical attention and journalists with appropriate credentials will be allowed to cross, the Israel Defense Forces said in a statement. Humanitarians, doctors, lawyers and other professionals will also have access based on approval by the civil administration. About 1,250 religious workers, along with 550 students and teachers, have permission to leave the West Bank, the IDF said. Israeli Defense Minister Ehud Barak ordered the closure during the Passover holiday. The measure was enacted "following situation assessments adopted by the defense establishment," the statement said. Closures preventing Palestinians from traveling out of the occupied territory are not uncommon during Jewish holidays. However, the latest comes amid increased tension between Palestinians and Israelis. On Friday, three Palestinians and two Israeli soldiers were killed in fighting in southern Gaza. On Sunday, Palestinian medical officials said that they recovered the body of a man, Silman Arafat, near where Friday's operation took place. Arafat was identified as a militant member of Islamic Jihad who participated in the fighting, officials said. The previous weekend, four West Bank Palestinians were killed in two separate incidents with Israeli soldiers. There has been increased rocket fire from Gaza into southern Israel in the past week. An immigrant Thai worker was killed last week when a rocket struck a greenhouse where he was working.